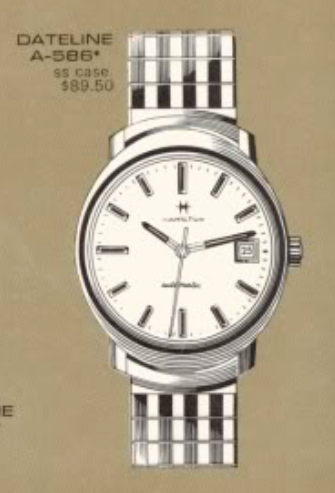 Calendar models were first introduced to Hamilton's line in 1954 but they really became main stream in the 1960's. They only offered the day of the month though... the first day and date models didn't arrive until the 1970s. So if you see a day and a date on a watch, you'll immediately know it's a 1970's model (or later). One of the last calendar models to be introduced in the 1960's was the 1968 Dateline A-586. It was only shown in the 1968 and 69 catalog. The Dateline A-586 came in a stainless steel case. It's hard to tell from the catalog image but it appears to have black highlights on the markers and the hands. It also has a black ring outside the crystal. I recently purchased an A-586 and it arrived on a bracelet but it wasn't the original bracelet. As you can see in the photo below, it was pretty beat up and very dirty. The black ring is gone but I suspect it is just worn away and not missing. The case back is engraved with 64027-3. The -3 means it's a stainless steel case and the 64, I assume, means that there's a Hamilton 64A inside. Oddly, the case is also engraved with a presentation from January 1966 - which begs the question was this watch introduced before the catalogs depicted it? Could be, or maybe it says 68 and the engraving just isn't very clear. One thing is for sure... it needs to spend a good while in the ultrasonic to get rid of the "old man funk" that is encrusted on the back. The Hamilton 64A is a 21 jewel variant of the same ETA movement that the 694A was based on - although the 694A is a 17 jewel grade. The extra 4 jewels are in the reversing wheels of the rotor assembly - otherwise I think the two movements are largely the same. With the dial removed, the movement looks just like a 694A that was used in the earlier Dateline A-series models. While the movement is being cleaned, I will polish the case to get rid of all the scratches. Then I'll re-enamel the black ring before installing a fresh crystal. Notice the inside of the case back doesn't say Lancaster PA... that's odd but not unheard of. The H logo confirms this is a Hamilton case. Everything is cleaned and dried. Now to put it all back together. The movement is reassembled and running nicely - now it's off to the timer. Everything looks pretty good - although the beat error is a tad high at 2.8ms. I should be able to reduce it to near zero without too much difficulty. A few tweaks to the location of the hairspring stud centers the impulse jewel in the pallet fork such that the balance is now almost perfectly "in beat" - meaning the balance swings equally to each side. You can see how the two lines move closer together from the center of the screen, to the right and then wrapping over to the left side, where the lines collapsed onto each other. A new GS Evr-Tite ET crystal in 30.1mm will be a nice improvement. The ET line comes with either a white (silver) reflector ring or a yellow reflector ring. This watch requires an ET30.1W crystal. You really can't use "the claw" with this style of crystal because the reflector ring prevents the crystal from compressing. Instead you have to use a crystal press to push it into the bezel... preferably without cracking it. With the movement reinstalled in the case and a new black lizard strap installed, this A-586 project watch looks fantastic, if I do say so myself. What a huge difference a new crystal and fresh enamel in the bezel made... don't you think? Great job on this one Dan. The before and after pics look like 2 different watches.